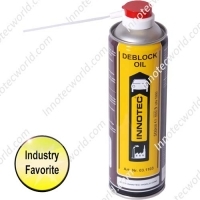 Deblock Oil is a mix of quick rust dissolvers and lubricants, that largely exceeds the action of ordinary penetration oils. Due to its low surface tension, the product has an enormous penetrating action, and therefore perfectly capable of dissolving tightly seized parts in the least accessible places. Deblock Oil contains graphite. This means that not only is it more powerful, but it has a slightly lubricating effect for applications requiring lubrication. The product can be applied on all types of metal. It can also be applied to sensitive joints, such as steel bolts in aluminium, to prevent damage when unbolting. Because with trucks many mounting points are difficult to access, or are located underneath, the aerosol packaging is specially designed to operate in any position. These points are easy to reach thanks to the special unbreakable nozzle and small tube. You can also use Quick-Grip when unscrewing seized screws or bolts. This special friction paste restores grip on damaged bolts, screws, screwdrivers and ring spanners, for example. With Quick-Grip on the head of a seized bolt or screw you can obtain maximum grip and so considerably increase your chances of removing it intact and with the least possible damage. Shake well before use. Spray directly on part for treatment. Let it penetrate for 10 minutes and turn the part loose. If necessary, repeat treatment. – Strong rust remover, loosens seized parts. – Low surface tension; high penetrating effect. – Quick effect on rust, dirt, etc. – On graphite basis; lubricates during disassembly. – Applicable on all types of metal. – Does not adversely affect rubber. – Easy to apply; the aerosol packaging operates in any position.